Welcome home, Baby Boy! Congrats to a special couple. 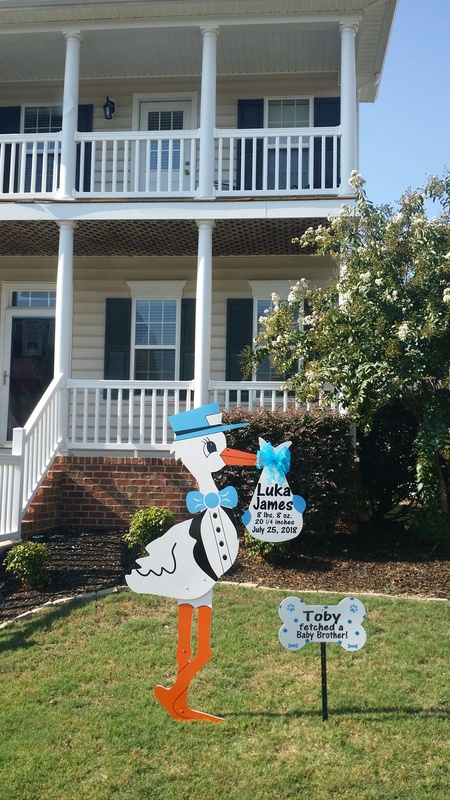 Luka’s grandma was so excited to arrange this special welcome home stork yard sign at her daughter’s home in Apex. Luka is one loved baby boy! Apex, Sanford, Pittsboro, Holly Springs, Fayetteville, Southern Pines, Pinehurst and surrounding areas! Sandhills Baby and Birthday Signs is the Sandhills region’s premier lawn sign rental service specializing in stork sign rentals for new babies and birthday signs for kids and adults! Call Sandhills Baby and Birthday Signs to help celebrate your new baby or grandbaby or a birthday party for your favorite birthday girl or birthday boy! You can reach us by phone at 910-723-4784 or visit us on Facebook, pinterest, and instagram to see more rental photos!